Some of the key questions that have been asked about us and our work over the years. 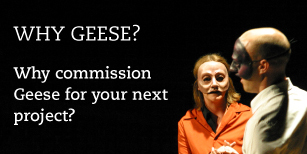 Are there any books written about Geese Theatre Company, or chapters in books? Is what you do dramatherapy or psychodrama? The simple answer to this question is "no". Both dramatherapy and psychodrama are specific psychotherapeutic disciplines that often focus on deep rooted trauma and its relationship to current behaviour. However, drama can be therapeutic, as in fact all arts, education and social interaction can be. The company has endeavoured to generate an approach that can provide the individual with a process that can stimulate both understanding of behaviour and also the potential for change. We have also built our knowledge and understanding of what are appropriate ways of working to ensure a safe process for the individuals we work with. What is the distinction between theatre and drama? Whilst these two terms are often used interchangeably we tend to make the distinction that theatre happens when one group of people, the audience, are observing a live performance presented by other people. Drama occurs when everyone present is involved in the action. Much of Geese’s work is a hybrid of the two forms, eg: our improvisational prison performance, Lifting the Weight, relies on a steady stream of dialogue back and forth between the audience and the characters. What is applied theatre and drama? Theatre and drama applied to specific audiences and settings with particular outcomes in mind. What is Geese's theoretical approach? What are the benefits of using theatre and drama over more traditional approaches of working with offenders? How do you feel the work impacts on participants? Does it work? Is it possible to come and do work experience / observe Geese's work? We receive several requests a week from students and other interested parties wishing to observe our work. Unfortunately, due to the nature of the work, the environments in which the work takes place and the types of client groups we are working with, observation is not a possibility. In order to best accommodate people who are interested in this type of work we run Information Sessions approximately every six to eight weeks. The performance was not only challenging but enabled prisoners and staff to view and experience, in real terms, the impact of domestic abuse on survivors and children. I would thoroughly recommend this company, they are truly awe inspiring…….